Normally, trips home to Montreal are a treat - we reconnect with forever-friends, spend time with family, and visit the places that defined our lives growing up here. But these aren’t normal times, and returning here with my wife to spend time with her hospitalized dad was, frankly, hard. The days were long and unsettled, sleeping fitfully in an apartment far from home, leaving for the hospital before dawn, spending the day and night there, then heading “home” into the darkness, only to repeat the process the next day. At times like this, you look for normalcy wherever you can. One night as we left the hospital, I realized we weren’t far from the iconic Orange Julep. Officially, it’s Gibeau Orange Julep, but everyone just calls it “OJ”. 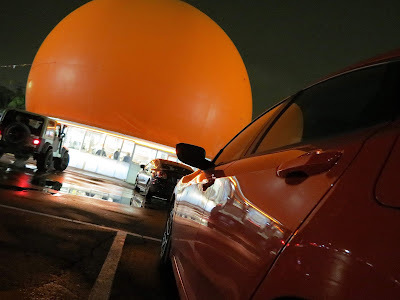 This giant orange, plopped unceremoniously beside an expressway off-ramp, has been here forever. As kids the ultimate treat was for our parents to take us here. Back then, servers on roller skates delivered the food on trays that hung precariously off the side of your car. The servers are long gone, and everyone lines up at the front counter. It’s old, kitschy, and ohmygod it’s perfection. This was where we drove when we wanted to show off our newly minted drivers’ licenses. We kept coming back to show off our cars, our clothes, or even our newest significant others. We’d park in the circular-ish lot, and hang out for hours over slowly-sipped OJ drinks and greasy-spoon-ish hot dogs, grilled cheeses and fries, talking about both everything and nothing at all. Little did we know it at the time, but we were all writing an indelible chapter in the stories of our lives. So when I came back here with my wife on this dark, sad night, it felt right to linger a bit longer and chat under the fluorescent lights pooling in the puddle-stained parking lot. As it was when we were first dating, it felt like home. Only this time I didn’t have to work so hard to impress her. Your turn: What place from your childhood have you returned to? What was it like?